I try to read a variety of genres, but one of my favorites is historical fiction. I'm a sucker for a good World War II book, even if there are hundreds if not thousands of good ones. 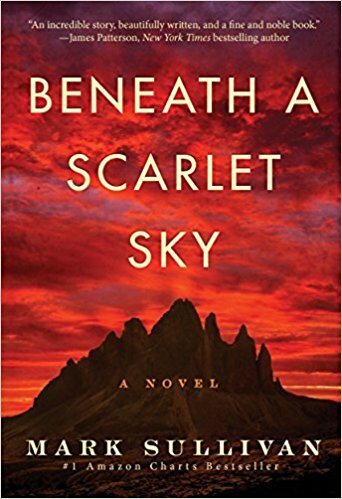 When I first read the synopsis about Beneath a Scarlet Sky by Mark T. Sullivan I'll admit I passed on it. But I kept seeing it come up on lists of best books of the year and eventually I just broke down and bought it. I'm so dang glad I did. The story is about Pino Lella an Italian boy who grew up in Milan during World War II. The book picks up with him a few years before his 18th birthday with the Nazi's overtaking Milan and his personal story through the end of the war. If even a quarter of the stories in this book are true Pino is a true hero. The book is broken into a couple of distinct portions of his life in the war. The first is a short introduction to Pino in his youth, a young man obsessed with finding a female counterpart. As the war in Italy ramped up his parents sent him away to a Catholic school near the Swiss Alps where he rescued Jews and helped them cross the border into Switzerland. The final section is after he turns 18 and becomes a personal driver for one of the highest-ranking Nazi's in Italy and spies on him for the allies. All three areas of the book are so brilliantly written that the entire story flies off the page. I've read my fair share of historical fiction, but this one is special in that the characters are as big if not bigger then the global war. There are so many times where Sullivan smartly takes the story to a personal level. Pino's struggle with friends when he becomes a Nazi. Pino's maturation process during his time-saving Jews to Switzerland. And probably the most profound is his outright confusion on what to do as he learns about the atrocities of the Nazi's. I hope the whole story is fact and not fabricated. Sullivan did a ton of research for this novel, and the accounts are from Pino himself (who is still alive) and anyone Sullivan could get a hold of to corroborate his stories. Even if they're not true (which I hope they are) it's a story that I will never forget. It's a story of heroism, loss and despair, and more than anything humans ability to love during the most perilous times. I love this book so much and am so glad I read it.